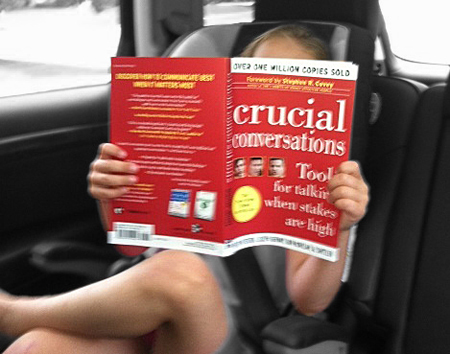 As many conversations are with my six-year-old, the full conversation was actually quite a crucial conversation about how to earn what you need and communicate that need. For the record, she “earned” the Barbie a few days later from her grandmother through some effective communication. Now THAT’S funny! It looks like you two will have a lifetime filled with interesting crucial conversations. . .
That is an awesome story! I will try it at home and see if my 6 year old, or any of the others bite! Great photo too! That is hilarious!!! I always read your tips; sometimes they apply, most of the time, just food for thought. I’m not poised enough to do all your stuff; haven’t tried, but like to read (and listen) to the articles and stories. Started to get your newsletter back in ’04 or so, when I had a foster home for adults and needed ideas on how to communicate. It didn’t do me any good, because I was dealing with (imagine that!) People!!! Anyway, great stuff, keep it coming, and maybe one of these days I’ll get good enough to try something and have it actually work.